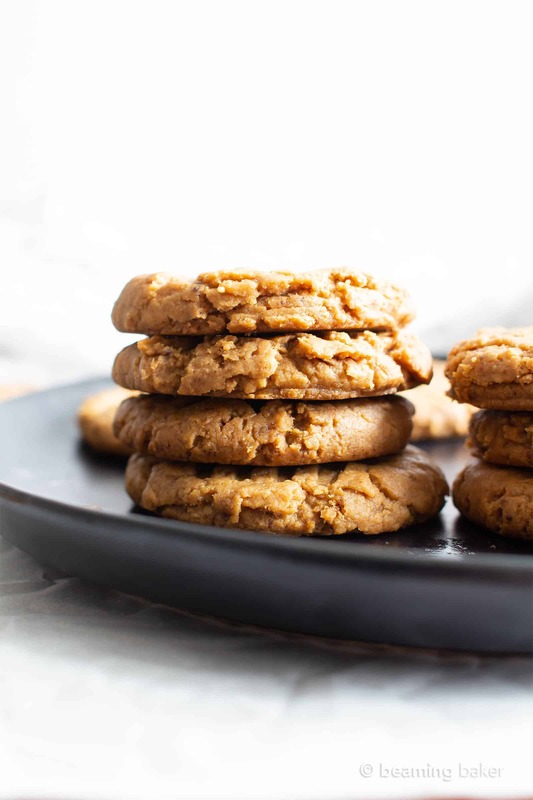 4 Ingredient Gluten Free Soft Peanut Butter Cookies (V, GF): an easy recipe for deliciously super-soft, flourless peanut butter cookies made with just a few healthy ingredients. Vegan, Gluten-Free, Dairy-Free, Oil-Free. 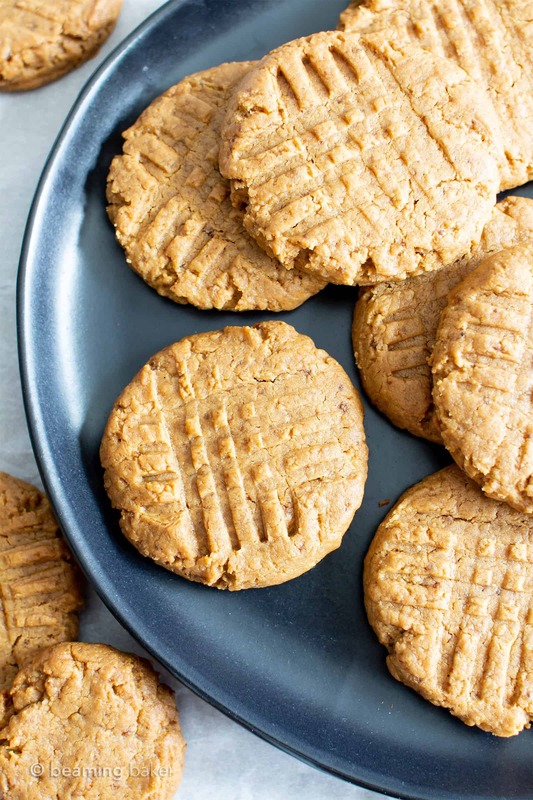 Can you ever have too many peanut butter cookie recipes? <– What a silly question, right? Dare I even ask it? ???? 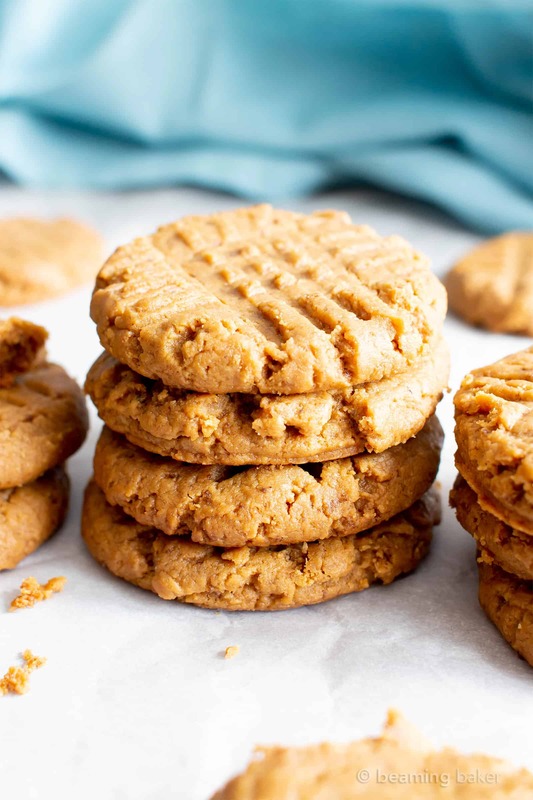 If you’ve been with me a while, then you know that peanut butter cookies are a big, big staple around here. Here are a few of my favorites (and yours too! 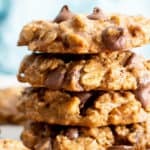 ): 3 ingredient no bake peanut butter oatmeal cookies, easy vegan peanut butter cookies (YUM), peanut butter banana breakfast cookies (yep, I said it), peanut butter chocolate chip oatmeal breakfast bars (basically cookies hehe). The funny thing is, I had a kind of love/hate relationship with peanut butter growing up. I mean, it was no chocolate, ya know? Also, we weren’t the type of household that had jars of peanut butter in the pantry at any given time. Can we add some/lotsa chocolate?? However, OF COURSE, anything but straight shots of peanut butter were always good. Meaning = peanut butter cups, peanut butter chocolate chip bites, chocolate peanut butter rice crispy treats. Especially peanut butter ice cream!! I didn’t know then what I know now—straight shots/scoops of peanut butter are only for the peanut butter savvy. You’ve got to have a slower entrée into something with ingredients you’re familiar with before you go for the pure stuff! But anyway, as I grew older, and, well, started this blog, I truly learned the deep pleasure of peanut butter–some of that can be credited to one of my favorite bloggers and friend, Sally, who’s a big pb lover. 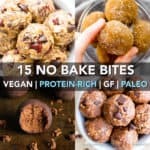 Point is, peanut butter is soooo filling, nutrient-rich, goes well with pretty much everything (pumpkin, oats, coconut, chocolate, fruits, you name it). 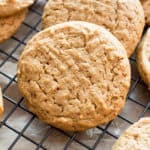 4 Ingredient Gluten Free Soft Peanut Butter Cookies (V, GF): an easy recipe for deliciously super-soft, flourless peanut butter cookies made with just a few healthy ingredients. Vegan, Gluten-Free, Dairy-Free, Refined Sugar-Free. In a medium bowl, add all ingredients. Whisk as long as you can. Switch to folding with a rubber spatula, until thoroughly mixed. Using a 1.5-tablespoon cookie scoop, scoop and drop cookie dough balls onto the prepared baking sheet, spaced evenly apart. Using a fork, press down on cookie to flatten. Repeat in the opposite direction, creating crisscross marks. Cookie won’t spread much. Bake for 10-14 minutes. Mine took 12 minutes. 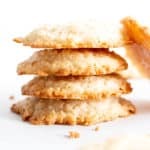 Transfer cookie sheet to cooling rack, and allow to cool for 20-30 minutes—do not remove from sheet for at least 20 minutes, as cookies are very soft and fragile. Then, if desired, transfer cookies directly onto the cooling rack to cool until completely cooled. After cooling, cookies will be firm, but still fragile and melt-in-your-mouth. Handle with care. Enjoy! Storing notes below. Also try my 4 Ingredient No Bake Chocolate Peanut Butter Bars and my 4 Ingredient No Bake Chocolate Peanut Butter Cup Oatmeal Bars. - Store in an airtight container for up to 1 week. Cookies become super soft and fragile on Day Two. If making for a party, make and serve day of. 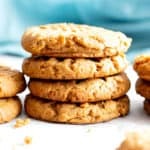 I love 4 ingredients easy recipes like this one my kids love peanut butter cookies and these are so much healthier! I know, aren’t they the best? 🙂 hope your kids enjoy it Claudia! Wow these cookies are so simple and so few ingredients. I just let let the cookies sit on the cookie sheet for 30 minutes. They are perfect and crispy and plan on making more for my daughters bday next week. I love that these are gluten free, yet you can’t even tell! So good! Yes, they are so wonderfully soft! ???? Hope you enjoy them Shanika! 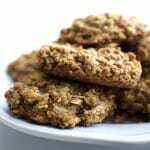 I love clean eating cookies with just a few ingredients and if they are vegan too they are a real winner – which can even please my vegan daughter. They look so yummy! Wonderful!! I hope you and your daughter get to try these. They’re amazing! 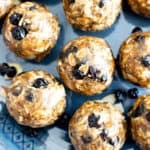 Thank you so much for making a healthy oil-free cookie! Definitely making these this weekend!! Such a great tasting healthy alternative !! 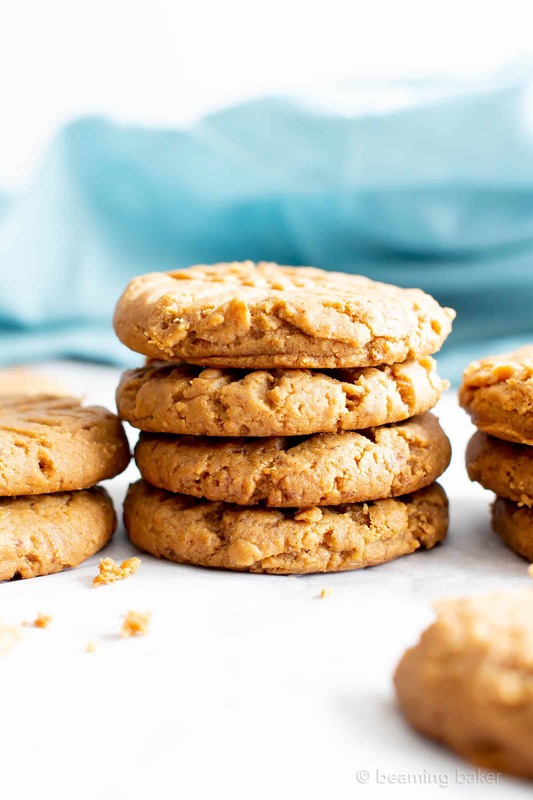 You can’t beat a good peanut butter cookie! You always make such simple yet delicious food. Thank you for that. Thanks Jessica! It’s my pleasure! 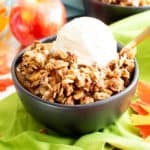 Super easy and crazy delicious! This is my kind of cookie! Woot woot! Hope you enjoy! You make it sound so easy! Can’t wait to try this one. I like this! Thank you for a great recipe! This should be on my must-make list! I absolutely LOVE peanut butter cookies, definitely one of my faves. And I love how easy and delicious these cookies look! Haha same here! Thanks Marsha! I’m not gluten free, dairy free, or anything else free, but I’d never say no to a good cookie! Thanks for the recipe!!! Haha yay! You’re very welcome Mimi! I’m so happy to hear that you enjoyed these, Anneka! 🙂 I love that sunbutter worked so well. Happy baking! I’m not the biggest fan of peanut butter, do you think it could work to switch it with almond butter?